There should be a weekly entry for Are You Sitting Down? here at Hugs, because it feels like forever since there's been a finished object to show. Well, at least the knitting part is done. A weird thing happened to my sock pattern when I started experimenting with different needle types, and it's going to be a pain to fix it. I don't know whether my tension changed, or whether the difference between a size up in squares and regular round needles is more significant than I thought, or maybe my feet went up a size? which is extraordinarily unlikely, but the bottom line is: the sock pattern that used to fit just fine doesn't any more. You may (or not) recall that I have three or maybe even four pairs of lightweight socks on different needles right now, most of them idling away between the gusset and the toe decreases. And that is because I'm not sure how long to make the feet before I start those toes: when I do the usual number of rounds, the end result just feels too short. And in a handknit sock, that is a sad sad result. Of course it wouldn't take long to figure out what is the right length. An hour or two of uninterrupted time to do the math and work up a sample for checking against would do it. A couple of movies' worth of knitting by trial and error would also be fine. I just haven't been at the intersection of 'uninterrupted' and 'sufficient brain' to do it. So I've kept on with my Stoddart socks instead - they didn't change, but stayed on the same needles they've been on since I first did the math for them. 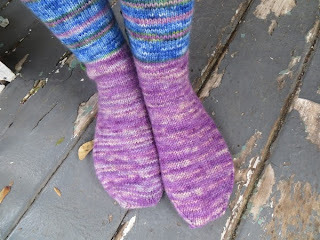 To date, the lovely purple socks have been my very favourites of all the Stoddarts - and then I got to the toe. 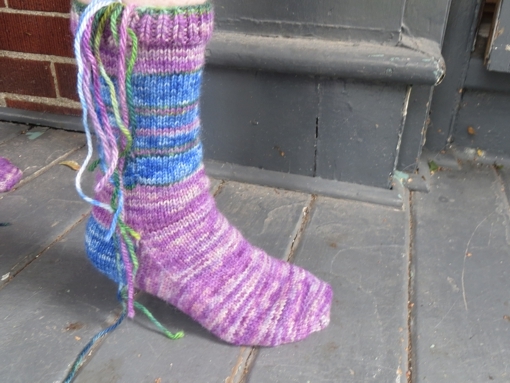 Because the purple yarn I made do with is a bit heavier than my usual boot weight. As I got to the toe I realized I was doomed and I started to put on the brakes, switching between socks and trying to guess or do math or go back to guessing as I knit. In the end I decided to go with my usual length, and then miscounted by one round, which I was afraid meant a lot of ripping out but turned out to be just right. WHEW. And so, apart from the many dangling strands I have to run in before the weather really gets cold, these socks are done and they are perfect. Even if they are a bit wider than usual in the foot, ahem. Meanwhile, I'm besotted with another knit I want to tell you about, but maybe not tomorrow because there are a couple of other things I want to share too. Hope to see you here either way, and have a great day today!